SAN CLEMENTE, CA--(Marketwired - Jan 14, 2015) - William Lyon Homes' Alora at Talega is brimming with excitement as the neighborhood's first residents settle into their elegant new homes. With every new move-in, the intimate collection of just 36 single-family luxury homes transforms into a genuine community with mingling neighbors and families quickly shaping the neighborhood's welcoming atmosphere. Those who choose to make Alora their home demand the extraordinary, and with each home's contemporary grandeur and richly detailed design, it's clear that the rewards of owning new are beyond compare. If interested in experiencing the lifestyle San Clemente's most discerning buyers are buzzing about, visit the Alora Sales Gallery today. For immediate details, log on to www.LyonAlora.com. "Watching Alora come to life as the vibrant, luxury neighborhood we envisioned is a thrill to witness," said Lesley Pennington, Vice President of Sales for William Lyon Homes. "If you're interested in owning at Alora, please remember that time is of the essence. This limited collection is quickly becoming a sensation in the area and now is a smart time to be a part of it." Alora's two-story homes are designed with impressive floorplans and meticulous refinements. The expansive interiors span approximately 3,949 to 4,503 square feet, with 4 to 6 bedrooms, 4.5 to 6.5 baths and 2 to 4-car garages in unique configurations. Every plan includes at least one first-level bedroom suite, which offers ideal accommodations for older children, multi-generational family members and guests, while features like outdoor rooms with large sliding doors and optional kitchens enhance the phenomenal Talega lifestyle. Prices start from the low $1 millions. Additional amenities include butler's pantries, wine storage, studies, guest suites and balconies. Individual residences also provide customizable room options for homeowners who desire the flexibility of altering key living spaces in the future. William Lyon Homes collaborated with notable architect Michael Woodley from Woodley Architectural Group to design richly detailed, expansive residences for those who aspire to be the very best. Only a special few will be fortunate to make Alora their own. The Talega of San Clemente community is conveniently located three miles from the Pacific Ocean, providing access to a variety of parks and recreational amenities, including 2,000 acres of open space and trails. The renowned Talega Golf Club is also nearby with its 18-hole, Fred Couples "Signature" championship golf course and Signature Grille. Privileges exclusive to Talega residents include the Talega Swim and Athletic Club, with clubhouse, multi-purpose sport court, sand volleyball courts, junior Olympic pool, resort pool and Splash and Play area. The community is within the Capistrano Unified School District that has two elementary schools and one middle school in Talega. Residents also have easy access to shopping and dining at the Talega Village Center. Talega is governed by a Home Owners Association supported by owner assessments to fund common area and facility maintenance. The Talega Maintenance Corporation (TMC) provides a vehicle for maintaining community recreation and common areas. Membership is automatic. Talega Lifestyle Corporations (TLC) created as a nonprofit corporation (501c4) is funded by a combination of sources, including community enhancement fees on residential sales, resales and nondeductible contributions, user fees, corporate alliances and partnerships, event fund raising and endowments. TLC is run by a Board of Directors appointed by its sole member, Talega Associates, LLC. Brokers will receive a 3% referral fee per closing. Brokers must bring client on first visit to register for broker referral fee. Buyers cannot be registered online prior to first visit. Broker referral fee to be paid at the close of escrow. It matters who your builder is, and William Lyon Homes means it when they say that they put themselves into their homes. They build each and every home as if it were their own and have earned a solid track record for constructing quality homes backed by a solid customer service program since 1954. Learn more by visiting www.lyonhomes.com for updated information on William Lyon Homes' new neighborhoods. Founded in 1995, Resmark is a leading national private equity firm focused on real estate and powered by core foundational discipline and focus. A fully integrated real estate investment group, The Resmark Companies' divisions -- Resmark Land and Housing, Resmark Apartment Living and Resmark Impact Ventures -- finance, acquire, develop and manage real estate in the Western United States, including California, Washington and Arizona, as well as in other select major metropolitan markets nationwide. To date, Resmark has participated in over 170 projects encompassing more than 27,000 single-family and multifamily residential units. Headquartered in Los Angeles, Resmark also maintains corporate offices in San Diego and Chevy Chase, Maryland. For additional information, please visit www.Resmark.com. To reach Alora's Model Homes and Sales Gallery, travel south on I-5, exit Avenida Vista Hermosa and turn left. Turn left on Avenida Talega, left on Camino Viento Fuerte East and left again on Via Paulina to the models. The Model Homes and Sales Gallery are open daily from 10 a.m. to 5 p.m. For more information, please call 949-388-1546 or visit www.LyonAlora.com. 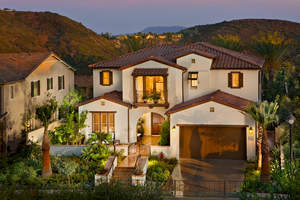 Alora offers the finest in luxury new home living within Talega of San Clemente.